Their voices are fascinating, their style of singing and ornamentation is archaic, distinctive and rooted in centuries of local tradition. 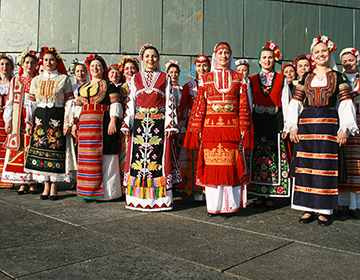 The Bulgarian Voices Angelite stands for the worldwide spread of the famous Bulgarian women choir singing since 25 years. Their international success (shows at the Nobel Price Award, the Red Square in Moscow or at the Grammy nomination 1999) and the non breaking international fascination throughout the years shows their uniqueness and quality. 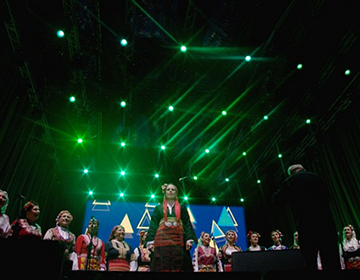 The choir is among the most renowned ensembles in the categories of Balkan and Bulgarian folk music. It was formed as a private choir from the ashes of the old State Television Choir, dating back to 1952, by the State Choir’s manager: Tanja Andreeva. The comprises two dozen female singers from across the nation under the leadership of Georgy Petkov. Prior to the fall of communism, the Bulgarian Voices Angelite were largely unknown to the world, but in the years since the Iron Curtain was lifted the ensemble managed to enchant the world with their singular blend of classical and folk traditions. This blend is further supplemented by their mysterious and cryptic manner of singing– peculiarly suspended, frequently dissonant (e.g. with major and minor seconds), and completely void of vibrato. 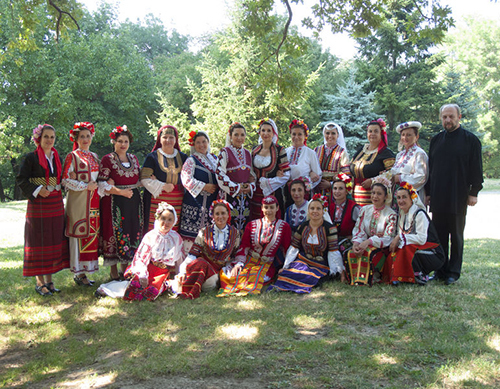 To say that the Bulgarian Voices Angelite is a mere folklore ensemble is to overlook its true potential. They have established an authentic style of their own by managing to advance in the sphere of art music, drawing inspirations from modern Bulgarian composers e.g. Philip Koutev, Stefan Kanev, Dimitar Dinev, Stefan Mutafchiev, and Nikolai Kauffmann, embarking on journeys with rock (Elio E Le Storie Tese), jazz (Moscow Art Trio), throat singing (Huun-Huur-Tu), hip-hop, and classical fusion (Sarband), whilst preserving its Balkan heritage derived from musical exchanges between Russia, Greece, Turkey, Hungary, Romania and Bulgaria. Therefore, then listening to the choir, the boundaries between East and West, young and old, pop and classic seem to disappear. The Bulgarian Voices Angelite has released many critically acclaimed albums internationally and are multiple Grammy nominees. Globe Music Media Arts is their U.S. record label, and JARO Medien is their European label (the same label that represented the old State choir). In 2012 the Bulgarian Voices Angelite started working on a new CD Angelina: a remarkable music program, in which the folklore of the ancient times enriches and renders its emotional energy to the music of today. The program surveys the contemporary music reality in the realm of folklore. 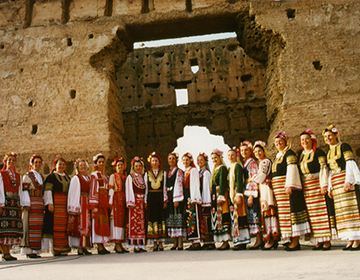 The Bulgarian Voices Angelite offers something that goes beyond the common folk cliché. One listener might think of archaic sound-worlds from far-distant times, another of the marriage of avant-garde and the medieval. The cryptic, mysterious, perhaps even somewhat mystical quality that characterizes the choir’s sound arises primarily from the singers’ preference for a second voice which is maintained a slight interval to the leading melody. 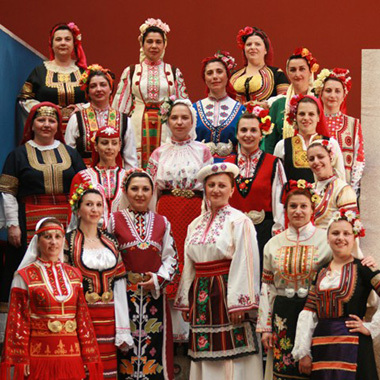 The Bulgarian Voices Angelite produces sounds of the most peculiar vocal timbre, almost as if it was not produced by the human vocal apparatus at all, but by an instrument from some foreign corner of the world. The singers use glissando, shouts, and crazy rhythms. This results in a kind of nearly-dissonant friction as well as a great radiant power similar to an unfolded color spectrum. The Angelite’s voices fan out into a colorfully glowing sound palette that plays with overtone resonance. 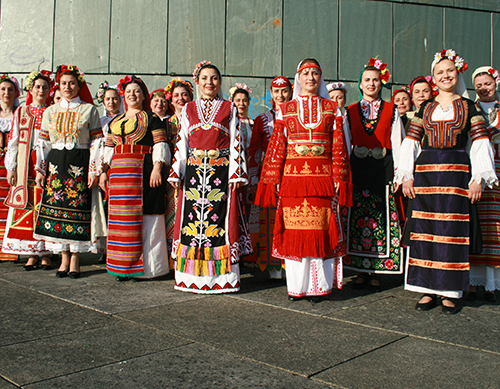 The Bulgarian Voices Angelite has performed practically everywhere: Germany, the Netherlands, Belgium, Denmark, Switzerland, Austria, Spain, France, US, Canada, Mexico. This is the choir that amazed the audiences on the Red Square in Moscow, and the royal families in Holland and Denmark. is the choir who has performed for the Maharajah of India, and at the Nobel Peace Prize Awards in Oslo. This is the choir for whom Phil Collins recently wrote the song “Transformation,” featured on the soundtrack and DVD of Disney’s “Brother Bear” hit movie. This is the choir recently featured in a multi-page color photo shoot in The New York Times Magazine. No one who has experienced one of the many concerts performed by this incomparable, legend-in-its-own-time choir has been able to escape the charm and fascination of its voices. On concert tours around the world, the singers have roused the enthusiasm of countless listeners with their surprising, enchanting and incredibly precise singing able to touch the soul.